In the highly competitive world of Web development, there's a crying need for a toolkit that allows developers to rapidly and efficiently construct dynamic, robust and scalable Web sites. This toolkit needs to be feature-rich yet easy to use, cost-effective yet labour-efficient, simple yet scalable. Now, I may be biased or a fool (or maybe even both), but I'm going to go out on a limb here and say that PHP is that toolkit. Think about it. The language is fast, robust and scalable. It's easy to use, comes with a great manual, and is backed by an enthusiastic user community. It comes with a rich feature set, and includes support for almost every new technology you can think of. It is, in short, the best open-source scripting language available today. This is not just advertising. I've been using the language for over three years now, and it still amazes me with its capabilities. Constructing a dynamic, database-driven Web site in Perl would take me a week; with PHP, I'm done in two days, and my code is cleaner, more readable and less convoluted than my best efforts in Perl. Now, if you're a cynical software programmer, all the rhetoric in the world isn't going to convince you. You're not going to believe a word I say until you see the truth with your own eyes. And so, over the new few pages, I'm going to demonstrate PHP's RAD capabilities by using it to build - very rapidly - a simple content publishing system for a Web site. Before we begin, a little context. The application you're about to see was an actual development effort I undertook a few weeks ago for an existing customer of my company. This customer already had a PHP-based Web site, which we'd developed a year ago; however, it now required an addition, in the form of a dynamic, database-driven page for corporate news and press releases. I was tagged as the person to implement this addition. I was told that the requirement was an urgent one, and that the customer needed it "yesterday". Since time travel is a feat I have yet to master, I was forced to decline this deadline, and instead promised to have something up and running in two days. This, then, is the story of how I spent those two days. An additional couple of pages added to the existing site to list the latest published news and press releases. 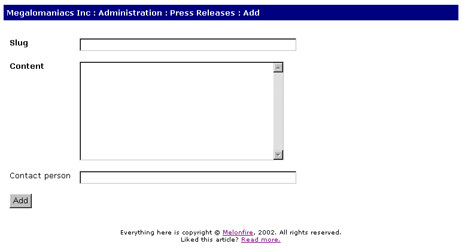 An administration interface so that individual editors within the PR department could easily publish new press releases to the Web site (her exact words were, "give me something simple, please! I don't have time for anything complicated!"). Since I was already thinking of using a database to store the press releases, I thought this would be a good time to get a little information to help me design this database. So I also asked her to define the attributes of a press release, so that I could build an appropriate administration module, and the functions available through this module. an information section containing the publication date and the name of the person to be contacted for further information on that particular release. the ability to delete older, out-of-date releases and news items. On the basis of this conversation, I was able to define the amount of work involved quite clearly. So I sent out some email to her and to my boss to get their approval and acceptance of the requirements document, and decided to start work immediately. Now, I can implement this application using a variety of different scripting languages and technologies. I can use Perl, PHP or JSP. I can store the data in a database, in an ASCII text file, or in an XML-encoded document. My personal preference here is PHP for the scripting, and a MySQL database for the data storage - first, because I find development much faster with PHP (and I also happen to like the language a great deal), and second, because the customer's existing Web site is also built on PHP and already has an active database server. Before reading further, you should download the source code for this case study, so that you can refer to it throughout this article (you will need a Web server capable of running PHP and a mySQL database). Got it? Good. Now, the first thing I'm going to do is design the database tables that will hold the news information, using the information provided to me on the attributes of a press release. As you can see, this maps right into the information on the previous page - I have one field for every element of a press release. 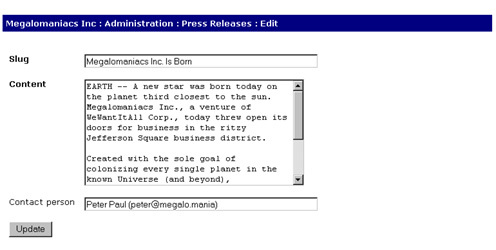 INSERT INTO news (id, slug, content, contact, timestamp) VALUES ( '1', 'Megalomaniacs Inc. Is Born', 'EARTH -- A new star was born today on the planet third closest to the sun. Megalomaniacs Inc., a venture of WeWantItAll Corp., today threw open its doors for business in the ritzy Jefferson Square business district. INSERT INTO news (id, slug, content, contact, timestamp) VALUES ( '2', 'Megalomaniacs Inc. Expands To Mars', 'MARS -- As part of its business strategy of \&quot;expand and swallow\&quot;, Megalomaniacs Inc. today announced that it had successfully sent a team of corporate raiders to Mars, in an effort to persuade the inhabitants of that planet to surrender their planet for colonization. Right. Let's get on with some code. You'll remember, from the requirements discussion a couple pages back, that this development effort can broadly be split into two parts. One part consists of the scripts that retrieve the list of newest items from the database and display this list to the user; the other consists of administration scripts that allow editors to manage this list, enter new information, and edit or delete existing information. "story.php" - the script which displays the full text for the selected story. These scripts are stored within the "user" directory in the source code archive. Here's my first script, which displays the list of five most recent press releases from the database. There's no magic here at all. This script simply connects to the database, retrieves a set of records, and formats them for display in a Web browser. Let's look at it in detail. Extracting this configuration information into a separate file makes it easier to update the application in case the database username or password changes. It's far easier to update a single file than it is to update multiple scripts, each with the values hard-wired into it. Again, the database name comes from the configuration file "conf.php". Note the addition of the DESC clause in the SELECT statement above - this orders the items in the order of most recent first - and the additional LIMIT clause, which restricts the resultset to five items only. Once a resultset has been returned, I've used the mysql_fetch_object() function, in combination with a "while" loop, to iterate through it and format the fields in each row for display. Note the addition of several lines of code that tell the script what to do if no records are returned by the query. If I didn't have this, and the database turned out to be empty (which might happen the very first time the application was installed for use), the generated page would be completely empty - not a very nice thing to show to your users, especially on a potentially high-traffic page. So I've worked around this with some code that displays a neat little message if no records are found in the database. It's important, as a developer, to think through all possible situations and write code that handles each one intelligently. The possibility of an empty database doesn't even occur to many novice developers - and this can lead to embarrassing situations if you're demonstrating the application to your boss...or worse, the customer. Finally, with all the records processed and displayed, the mysql_close() function terminates the database connection. With that, I've successfully completed the first part of this development effort. I now have a primitive publishing system that can be used to provide users of a Web site with news, press releases and other information. At this point in time, I do not really have a simple way to update the database with new information. In order to insert or edit information into the database, I need to know SQL and have access to a MySQL client. This works fine for me, the developer - but remember what the customer said about wanting something simple and easily usable? Obviously, I cannot ask the customer to learn SQL just to update the database. So I need to develop a simple, friendly interface that she can use to update the database. Which brings me to the second part of the development effort - the administration module. "add.php" - the script which allows the administrator to add a new record. These scripts are stored within the "admin" directory in the source code archive. When the application is finally uploaded to the customer's Web site, this directory will need to be protected against unauthorized usage via Apache's HTTP authentication mechanism (for more information on how this works, take a look at the links at the end of this article). Pay special attention to the links to "edit.php" and "delete.php" in the script above; you'll see that each of these scripts is passed an additional $id variable, which contains the unique record identifier for that particular item. Don't worry too much about why I'm doing this - all will be explained shortly. Next, "add.php". If you think about it, you'll realize that this script actually has two components to it: a form, which displays fields for the administrator to enter information, and a form processor, which validates the input and inserts it into the database. Based on the presence or absence of the $submit variable, the script can take a decision as to whether to display the initial form, or initiate the form processor. Fairly simple, this. The first thing to do is ensure that all required values are present, and to generate errors if not. These errors are stored in the array $errorList. In the event that the contact person field is left empty, a default value is used; this value is pulled in from the configuration file "conf.php". Once all the data validation is complete, the $errorList array is checked for entries. If entries are present in this array, a message is displayed listing the errors; if not, an INSERT query is generated to add the data to the database, and a success message is printed to the browser. So that takes care of adding new data to the database. Now, how about deleting it? You'll remember, from the discussion of "list.php" a few pages back, that the script "delete.php" is passed a $id variable, which holds the unique database identifier for the selected news item. The script "delete.php" needs this identifier in order to delete the correct record from the database. This is so simple it hardly requires any explanation. The ID passed to the script via the $id variable is used to construct and execute a DELETE query, which removes the corresponding record from the database. Short, sweet and quite efficient. The last item on the agenda involves updating, or editing, a news item. The script that does this is called "edit.php", and it's a combination of both "add.php" and "delete.php". Like "delete.php", "edit.php" also gets the record's unique identifier via the $id variable. It now needs to display a form similar to that used by "add.php", except that this form needs to be pre-filled with the data for that news item. Using the identifier from "list.php", "edit.php" queries the database for the fields relevant to that particular record, and uses that information to pre-fill an HTML form. Note that the $id variable is also attached to this form as a hidden variable; this ID will be used by the form processor when constructing the UPDATE query. You might be wondering why I've bothered to check the number of rows returned by the query, and written code to display an error if no rows were returned. This is necessary because, if the identifier provided to "edit.php" is invalid or non-existent, the query will return zero rows, and the administrator will be faced with a form with no data in it. Most of the time, this additional check is redundant, since the identifier will be generated from "list.php" and will therefore usually be valid. However, in the event that someone - a malicious hacker or, more likely, a company employee with too much time on his hands - decides to experiment with the URL string, changing the ID that gets appended to it to an invalid value, it could result in a series of ugly error messages or - even worse - cause the application to break. Therefore, by adding this check, I'm increasing the overall security of the application and simultaneously reducing the possibility of error. This is almost identical to "add.php", with the obvious difference that this query string uses an UPDATE command, while that one used an INSERT command. And that just about concludes this case study. I now have an application that meets all the requirements defined by the customer. All that's left is to upload it to their Web site, run a few tests on it, and give them a call to let them know where to send the cheque. As you can see, it's extremely easy to build a simple publishing system with PHP and MySQL. The two technologies, combined together, are so powerful that putting together dynamic, robust Web applications, like the one just described, is a snap. It's also fast - I estimate that I spent a total development time just under four hours on this project - which can come in very handy when working against aggressive deadlines. Note: All examples in this article have been tested on Linux/i686 with Apache 1.3.12 and PHP 5.0.1. Examples are illustrative only, and are not meant for a production environment. A fictitious company name has been used in this case study to protect the identity and reputation of the original subject. Melonfire provides no warranties or support for the source code described in this article. YMMV!